Through their official website, Arsenal have announced that Republic of Ireland star Louise Quinn has penned a new contract with the club. The 2013 FAI International Senior Women's Player of the Year was offered a new deal after impressing throughout the Spring Series. Louise told arsenal.com : ''I’m excited to have extended my time here at Arsenal. It’s a great club. The players, staff and facilities are all fantastic. 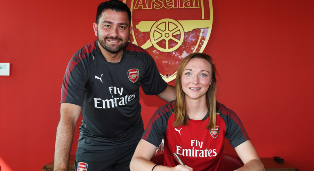 Aged 27, Louise Quinn defended the colours of Eskilstuna United, University College Dublin, Peamount United and Notts County Ladies before she was snapped up by Arsenal in May 2017.